Next morning, we Yelped places to eat in Portland. We went to downtown Portland which was similar to San Francisco and LA with the one way streets and the difficulty of finding parking spots. Yelped suggested us to go to Mother’s Bistro since it had 4 stars with more than 700 reviews. The restaurant was very homey, service was prompt and friendly, and of course the food was scrumptious! I ordered a brisket, melted cheese sandwich called Mother’s Reuben. Dasom was craving french toast so she got Crunchy French Toast. Dasom’s french toast was different from any other French toast that I’ve ever tried. It had cornflakes on top of the french toast which actually added more flavor and texture to it than normal French Toast. We asked our waitress if she had any suggestions of what we should do around the area. She said to drive down several blocks and make a right turn into a shopping area. We took her suggestion and was on our way to go shopping after we ate. Somehow we missed the turn and just kept driving straight. As we kept driving straight, we saw a sign that said, “Puttick’s Mansion,” and immediately followed the sign. We were just curious about this masion. 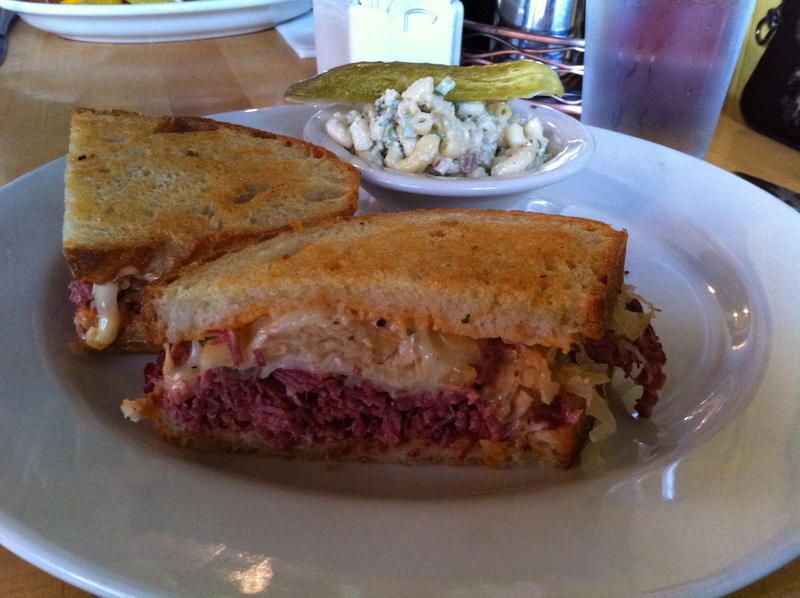 My Mother’s Reuben. Yummy in the tummy indeed! We asked our waitress if she had any suggestions of what we should do around the area. She said to drive down several blocks and make a right turn into a shopping area. We took her suggestion and was on our way to go shopping after we ate. We missed the turn and just kept driving straight. We saw a sign that said “Puttick’s Mansion,” and immediately followed the sign. We were just curious to see this mansion. Driving straight to Puttick’s Mansion after missing the turn. Nature is everywhere! 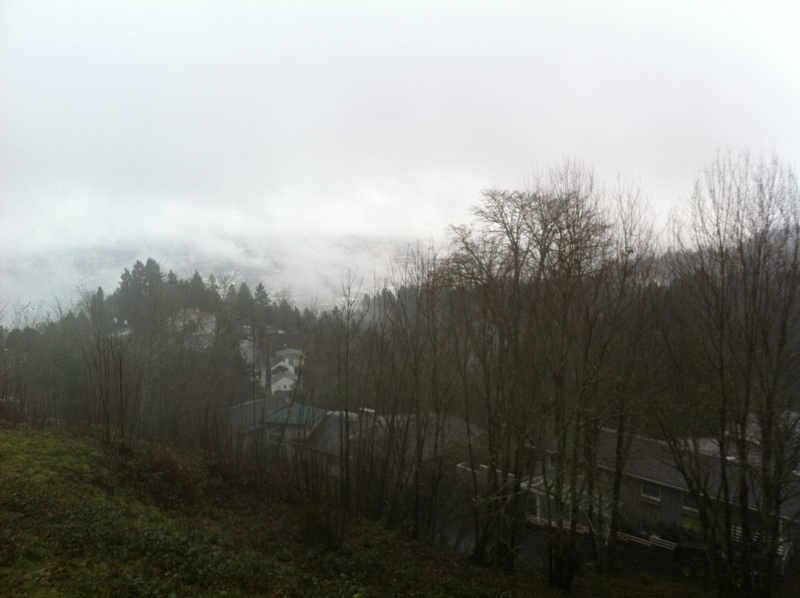 We got to the top of this hill where Puttick’s Mansion was and found out that it was closed! Closed for renovation purposes. As we were leaving the main entrance, we saw some kind of construction/janitor type of worker by the mansion. We decided to talk to him and ask him what Puttick’s Mansion was all about. First he introduced himself as Fernando who worked for the city of Portland. He briefly shared that Mr. Puttick was a wealthy man who owned Portland’s main newspaper company. He was so wealthy that he bought a mansion and then died years later. Then his mansion turned into a museum. The end! After sharing that with us, we talked some more and we learned that Fernando is originally from South Central LA! What a small world! 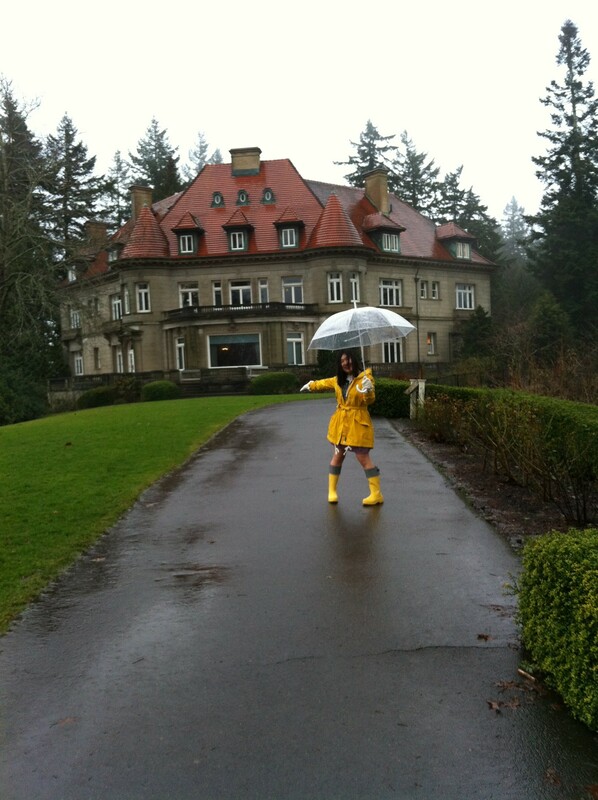 Dasom in front of Puttick’s Mansion. He decided to move to Oregon because he didn’t want his kids to grow up in an unhealthy environment even though he was not part of any gangs in LA. In addition to that, he said that Oregon is just a lot cheaper to live compared to California. It was definitely fun talking to him because he just had so much to share. He told us that we came to Portland at the wrong time because of the weather. He said to come back in the spring time when the weather and view is beautiful to experience. After talking to him, we decided to walk around the mansion in the rain! Afterwards, we went shopping! We had to take advantage of the “no sales tax” in Oregon. We found the shopping center that the waitress told us about. The center had stores like Gap, Levis, a store like Buffalo Exchange, Urban Outfitters, etc. At Urban Outfitters, there was an employee there and we found out that she’s originally from Long Beach! Small world again! 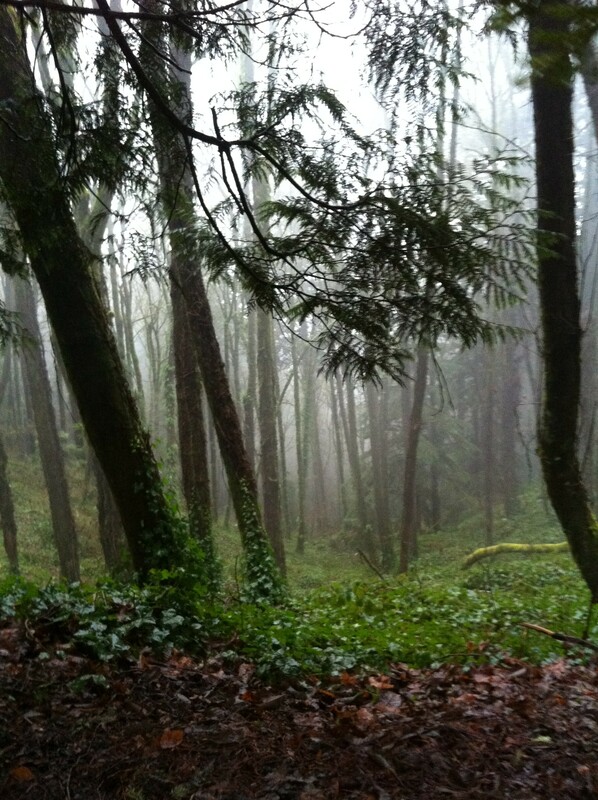 She too moved because it was cheaper and loved the nature in Portland. Dasom and I took minor advantage of the “no sales tax” because there wasn’t much to buy. We both just bought a belt from Gap on sale and with no sales tax. Little double whammy! One set plan we had while we were in Oregon was to visit our friends! 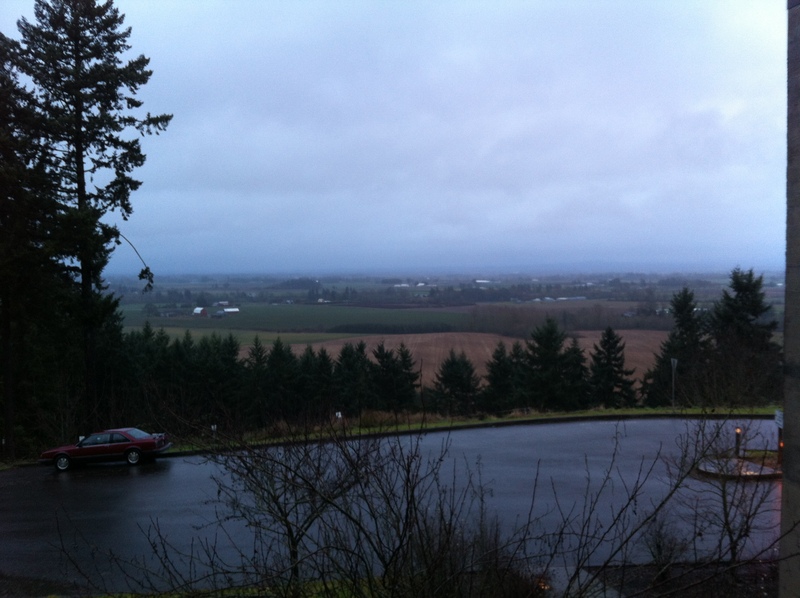 We have a friend named Aristotle who goes to a Catholic university in Mount Angel, Oregon. Our drive to Mount Angel was scenic and historical especially as we got closer to the university. Once we were in Mount Angel, we noticed that the community neighborhood was strong in Catholicism. We learned that the city was formed by saints therefore majority of the people there are Catholics. Aristotle gave us a tour of his campus and it reminded me of Harvard. Though I’ve never been to Harvard, I imagined Aristotle’s school to be the mini version of Harvard because it had the brick buildings with so much history to it. Walking around his school was so peaceful and refreshing. Nothing is polluted nor are the buildings crammed, so it makes you want to do yoga or sit down and soak in the beauty of nature there. Random fact about his school is that if you’re a student there, you basically know all the students and staff because there’s less than one or two hundred students there! It’s definitely a close knit school. We were only there for a short period of time because he had to get going for a meeting at school. Another friend we wanted to meet up with was Ylai (pronunciation: eee-ly). She goes to Oregon State University and was an hour or two away from Mount Angel. Unfortunately, we weren’t able to meet up with her because we got lost in the rain. 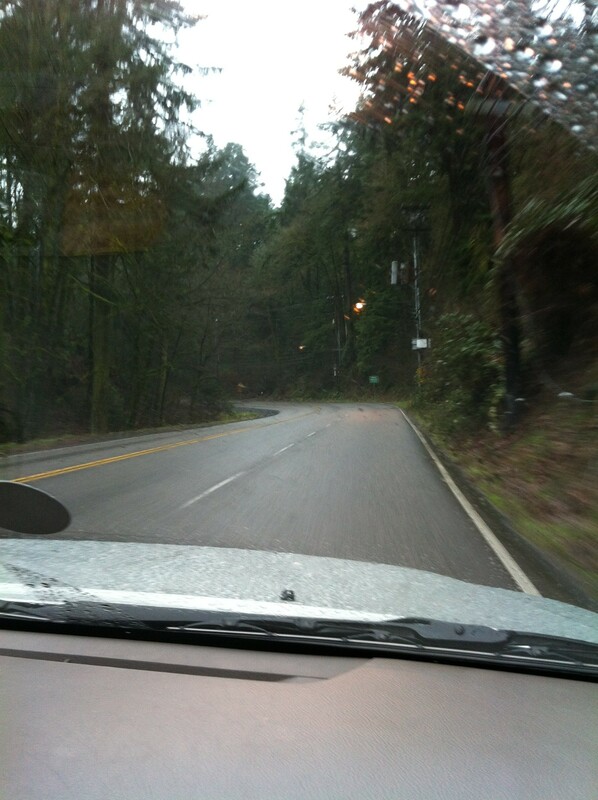 Driving in Oregon with the rain is definitely challenging because their street signs are not quite visible. The lights there, they don’t really exist except your car headlights. We drove around for so long and decided to give up and pull over to a gas station. By this time, it was around 6 or 7PM, meaning dinner time. We got some hot water from a gas station and had cup of ramen again in the car. For dessert, we had Cuties from Costco. While we were having dinner, we were talking about what we should do next. We were not planning to spend another night in Oregon because it was just not part of the unplanned trip. So we thought, let’s just go back to NorCal! Once were done eating, we changed into comfy clothes and had to get Starbucks for the long drive. I must tell you that, anytime we wanted Starbucks, it was nowhere to be found. Here in SoCal, there’s a Starbucks for every ten minute drive. Don’t take Starbucks for granted! Anyway, we found a Starbucks at a Safeway market. FYI: Safeway is like their version of Ralph’s. We got there right on time when they were close to closing. We quickly ordered, got our drinks, and were finally on our way back for another 12 hour drive back to northern California! What happens during the 12 hour drive? Oh, many things! You shall find out in the next post! ← Oregon Trail – Off We Go!